When the Brewers selected Dylan Covey with the 14th pick in the 2010 Draft, the young pitcher had a decision to make. He could sign and begin his professional career as one of the county's top-ranked prospects or head to college at the University of San Diego. Unfortunately for the then-18-year-old, fate stepped in and made the choice for him. Diagnosed with Type 1 diabetes just days before the Draft deadline, Covey had his life turned upside down in an instant. Instead of embarking on a career as a highly touted first-round pick, the Southern California native faced an uncertain future and decided to play at USD. "It was really tough on both sides," Covey said. "The Brewers didn't really know how diabetes would affect me and neither did I. That's basically what it came down to -- being unaware what taking medicine every day would do to me and how my body would react to it." Covey pitched for three seasons at San Diego and declared for the Draft following his junior year in 2013. Unlike his experience three years earlier, he had to wait a little longer to hear his name called. The A's took him in the fourth round, giving him a second chance at fulfilling his dream. "My first year in college, there was an adjustment period in learning how to deal with [diabetes]," he said. "But ever since then, I've had everything under control. It's almost nonexistent at this point. I got used to it as a freshman and it's just a normal part of my life right now." The A's No. 19 prospect began his career in 2013 and won 15 games between 2014-15, striking out 192 over 280 1/3 innings. 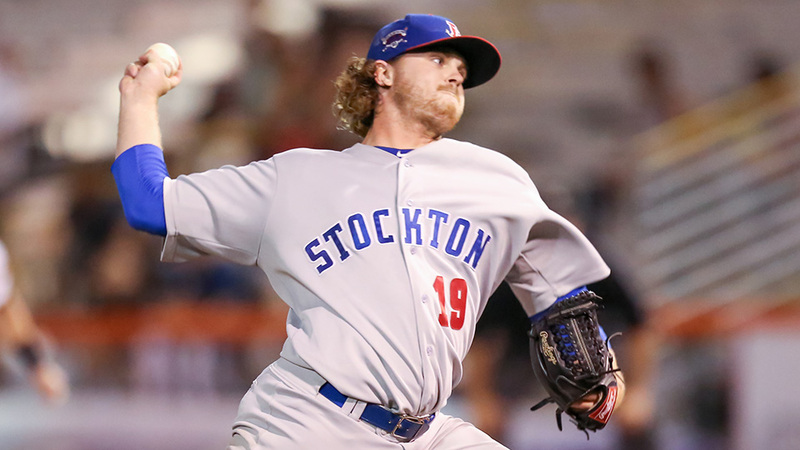 Promoted to Double-A Midland prior to this season, Covey contributed early to the RockHounds' success with a 1.84 ERA and 26 strikeouts in 29 1/3 innings. However, he sustained an oblique injury on May 8 and did not pitch again the rest of the season. "It was really hard," Covey said. "It was a big year for me, a Rule 5 year, a [roster] protection year. I was starting to pick up steam and the timing was unfortunate. Having to be in a hotel in Arizona for 10 weeks rehabbing and not being able to put that uniform on was tough." Assigned to the Arizona Fall League to make up for lost time, Covey has shown he's healthy and ready to put himself back on the path to the big leagues. "I'm here not only to put myself out there as far as an AFL showcase goes but to eat as many innings as I can," he said. "Oakland wants me to concentrate on throwing more strikes and getting hitters out in as few pitches as possible. So I'm trying to work on that in my bullpen sessions and carrying it over into the games." Covey has a 2.65 ERA in four starts for Mesa, allowing five runs on 13 hits and five walks with 11 strikeouts in 17 innings. He tossed five hitless innings against Surprise on Tuesday, combining with A's No. 10 prospect Frankie Montas and Marlins right-hander Drew Steckenrider on the third no-hitter in AFL history. "It was a blessing in disguise in a way," the 6-foot-2 hurler said of his injury-filled year. "I was sort of a max effort pitcher and I think that might have been a contributing factor to my injury. Now I'm learning that I don't have to go so hard on every pitch to be effective. I feel like I'm finding my identity in the AFL as a pitcher, so I'm trying to look at the whole year as a positive rather than as a negative." Despite the obstacles and seriousness of his diagnosis six years ago, Covey is inching closer to the Majors. It's something he readily admits to thinking about without obsessing. "I think it's something all of us think about. It's the ultimate goal that we strive for," he said. "But you can get caught up in why you're not moving up quickly enough or get lost in your numbers too easily. I just try to go one pitch, one batter, one inning at a time. Hopefully, the results speak for themselves and I can concentrate on doing what I do best -- going out and pitching." Riding high: A strong season has gotten only better for Steckenrider. The 25-year-old recorded 14 saves to go with a 2.40 ERA and 71 strikeouts over 52 innings across three levels in 2016, including 10 appearances with Triple-A New Orleans. Through his first six AFL outings, he's yet to allow a run while yielding four hits and a walk with 11 punchouts in eight innings. He closed out Mesa's no-hitter with a perfect inning to earn his second save in Tuesday's 1-0 win over Surprise. Jansen healthy again: Trying to jump-start a professional career that's been marked by injuries, catcher Danny Jansen is doing his best to make up for lost time in the AFL. The Blue Jays' No. 30 prospect appeared in a career-high 57 games in 2016 -- 53 with Class A Advanced Dunedin -- but again missed significant time due to hand surgery. Still only 21 years old, he's hitting .275 with two triples and nine RBIs in 14 games with the Solar Sox, showing the potential the Jays saw when they selected him in the 16th round of the 2013 Draft.